Today we drove through green, lush countryside that was broken up by sheets of purple lupins. They were introduced to Iceland from Alaska to retain the soil on lava flows and are now - did you guess? - a huge problem because they are unstoppably rampant. Sigh. (We have the same problem, on a fortunately much smaller scale, along the rivers in the South Island). But they do look pretty in July, certainly. There weren't initially many animals to see since the sheep at least are free-range (there will be a national huge round-up soon, the réttir, which would be something to witness) but masses of birds, notably oystercatchers, and Arctic terns, which do the most incredible annual migration. Honestly, can you believe it? They fly from the Arctic to the Antarctic! Amazing. It never fails to amaze me, how hard birds make life for themselves. But respect, certainly - especially since one has been tagged and is now certifiably 22 years old. That's a whole lot of miles. We drove around an edge of - wait for it - the famous Eyjafjallajókull which, if you want to sound clever next time it erupts, as it will, is pronounced eye-a fyatla-yokult. It dominated the skyline, not high but immense, as we drove along the coast past now-inland sea cliffs that were streaked by high waterfalls, so many that there was no question of stopping for a closer look at them all since we had a long way to go. We did stop at one, though, to soothe our itchy shutter-fingers. Way out to the right was a 450 km stretch of black sand beach ("longest in the world!") where there's a crashed (emergency-landed) US Navy DC3 from 1973 that people spend hours trailing out across the lava fields to look at. Much more impressive was the Skógafoss waterfall - and personally satisfying too, since it prompted the first Secret Life of Walter Mitty reference of this trip. It's not surprising it was chosen as a location: it's 60m high and 25m wide, the water plunging off the top of the seacliff very picturesquely. Of course, there were masses of tourists there - but since I'm one myself I should stop sniping at them. In sunshine, it has a permanent rainbow, but sadly we had a grey sky at that point. We heard lots of volcano facts from Pàll - Iceland does a mean volcano, with regular huge eruptions and quite a few now well overdue. He also did a lot of growling about stupid tourists getting into trouble out hiking and risking the lives of the volunteer rescue services, who he totally respects as heroes. Our next stop was at Dyrhólaey, which sounds a bit Game of Thrones-ish (and they did a lot of filming in Iceland too). It's a dramatic headland pierced with holes, giving views of spiky islands along the coast, with lots of cute puffins nesting, flying and floating on the sea. Then we went down to Reynisfjara, a black beach, past a big notice warning sternly of "sneaker waves" and walked along for a closer look at those pointy rocks in the sea. The cliffs here are basalt stacks of hexagonal columns, like piles of huge pencils, some horizontal, others vertical and making the perfect backdrop for selfies. Really spectacular - plus more puffins and other seabirds, caves, and always the chance of some unsuspecting tourist being caught out by a huge and unpredictable wave rushing in from the Atlantic. 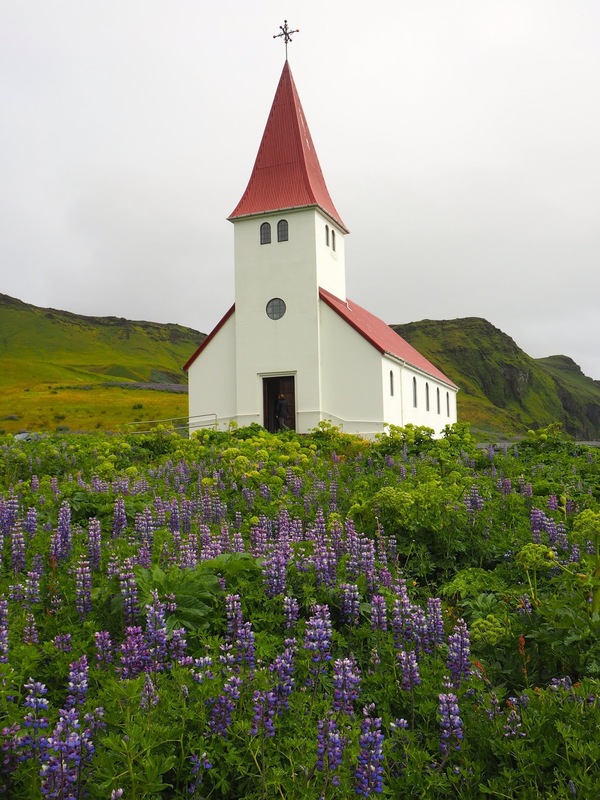 The lupins came into their own at Vik, where they surrounded a pretty little church on a hill above the town, and almost made up for our not seeing it in its more common Instagram form, as a silhouette beneath the Northern Lights. The sun was out and it was beautiful. I really enjoyed eating my sandwich on the black sand beach. Then we were back on the bus for a 3-hour drive towards Jökulsárlón Glacier Lagoon. En route there were Icelandic horses, lots of them (77,000 altogether in Iceland - that's a much more impressive horse-to-population ratio than the sheep one they're so proud of), plus waterfalls, glacier tongues, brown lichen-softened lava fields, lupins, one-way bridges (unlike ours, with no give-way guidance: it's first come, first served) and history. Like in 1783-4, there was constant winter caused by an eruption haze ("the worst in the world!") that killed vegetation, animals and people, 20% of the population. "It did happen, and it will happen," said Pàll sombrely. And, ice facts, which was of course appropriate. Ice is not just ice, you know - the blue ice of bergs, for instance, is that colour because of the pressure that formed it, and it melts very slowly. Conveniently, that means that cubes of it in your drink will last 6-8 times longer than a regular freezer ice cube. Good to know! After such a long drive, we all perked up when we got to the Diamond Beach - partly because of the icy brisk wind, but mainly because it was so gorgeous. The black sand was littered with small icebergs, all shapes and textures, glistening like, well, diamonds against the black, and popping and dripping quietly in the sunshine. And if that wasn't beautiful enough (we passed a bride in gown - and thick parka - on her way down for a photo-shoot) there was the lagoon itself, blue and lovely and littered with lots and lots of proper, Antarctica-type bergs, big and small, white, blue and streaked black, smooth and pitted. It was a glorious sight. And beyond them, the icy cliff of the glacier tongue dropping down from the mountains behind. Truly spectacular, especially in the sunshine we were so lucky to have. We went on a cruise then in a LARC - not included, but unmissable - which took us on a tour around the lake to inspect the bergs more closely, and even to taste a bit of one that was delivered to us by zodiac. Our guide, Pólk, cheerfully held it in his bare hands for ages as he talked about the glacier - brrr! And finally, after a very long day of driving, but with some spectacular breaks, we got to our guest house for the night, tucked away up a valley against a waterfall-streaked cliff, with long views towards the sea. I can report that a supermarket sandwich and a can of Campbell's chicken soup mixed with a can of sweetcorn make a super-easy and very substantial dinner.